This chalkboard menu sits outside the new Cocoa Bar, a coffee, chocolate and wine lounge around the corner from me on 7th Ave. in Park Slope, Brooklyn. 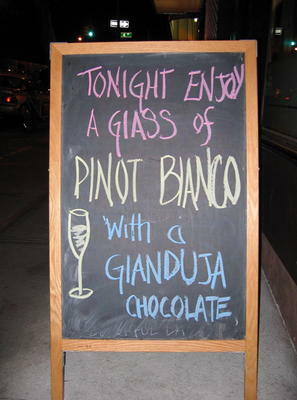 What makes this sign extra special is not just the GlASS, but the GlASS of PINOT BlANCO ... or is it BIANCO?! See, Pinot Bianco is the Italian term for a varietal pressed from the family of Pinot grapes, and Pinot Blanco is the Latin term. So is this a case of double lowercase L's, with GlASS and the Latin BlANCO? And then there's that GIANDUJA Chocolate ... I wasn't sure if it was Glanduja or Gianduja, so I had to look it up. Turns out it is Gianduja. The point is that between GlASS and BlANCO/BIANCO, and having to look up Gianduja because of some crazy, chalky handed menu writer, I've lost my appetite. I am reluctant to patronize this establishment, at least until they fire the employee who wrote this menu. By the way, this is not the first time we've had an ambiguous case of lowercase L.
What was it that set you over the edge about the lowercase L? I agree with you it can certainly be frustrating. As a former menu writer myslef, I promise you I was always careful. All my letters were either uppercase or lowercase. It leads for less confusion. Freya, I wouldn't say anything in particular set me over the edge. Rather, it is something that I began to notice more frequently when I moved to NYC in 1996, but never had a way to tell the rest of the world. Today, with the popularity of blogs and availability of affordable digital photography, I would be foolish not to share this with everyone. Plus, as a self-employed cartoonist in Brooklyn, I often have more spare time on my hands than I know what to do with. I'd love to try a Pinot Bianco, what is it?